So far, I have the Zeiss Conquest 4.5-14x50mm Scope mounted on the FNAR Rifle using medium height Burris XTR Xtreme Tactical Rings. Now I need to determine what the centerline scope height is above the barrel centerline. I will use the scope height in ballistics programs to calculate bullet trajectory and compare different ammo. Since the scope comes with a 1" tube, then half the distance to the center of the tube is 1/2". As a check, I did measure the tube diameter and it was on average about 1.003". For what we are doing, 1/2" will be fine. The next portion is the ring height. Burris states them as 1/2" height rings and this is measured from the bottom of the arc for where the scope rests to the top portion of the rail attachment area. 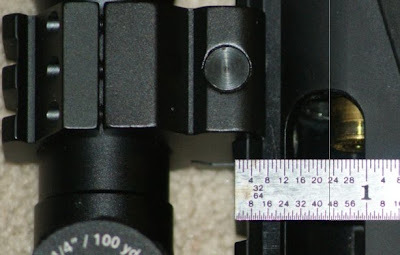 After measuring the scope installed on the rail, the gap between the bottom of the scope tube to the top of the rail comes out to be 0.501". Again, for what we are doing, 1/2" will be fine. The last portion is the distance from the center of the barrel to the top of the rail. This was a little more tricky and has the most room for error. I put the gun on the floor with an empty cartridge most of the way in the chamber for reference and placed a scale lined up with the top of the rail. Then I put my longest lens I have on my camera and got a chair out of the kitchen. By standing on the chair and taking the photo, I could get a close up photo and have the camera a good distance from the rifle to minimize angle errors due to the perspective of the camera. With this photo below, I was easily able to determine where the edge of the brass started with relation to the scale (notice I marked the photo with a vertical white line). You can see in the photo it was 23/32" (0.72"). Now all I needed to do is measure the diameter of the brass (0.470") and add half of that (0.235"). Therefore the total height for this portion is 0.955". Since I already know that the ballistics calculator I will be using only allows for one decimal place when inputting scope height, I went through all this effort just to round it to and even 1.0". Again, all of this effort just to come to the final answer of a 2.0" scope height measured from the center of my barrel to the center of the scope tube. For those of you who may or may not be struggling with me rounding the scope height, I'm going to show what a ballistics calculator outputs for both a 1.9" and 2.0" scope height. There are many online calculators. The one I'm using for now happens to be found at the Hornady web site. The trajectory past my 200 yard zero are: 300 yds delta of 0.1", 600 yds delta of 0.2", 800 yds delta of 0.3", 1000 yds delta of 0.4". Bottom Line: A great deal of accuracy is not required when determining this height for most shooters. 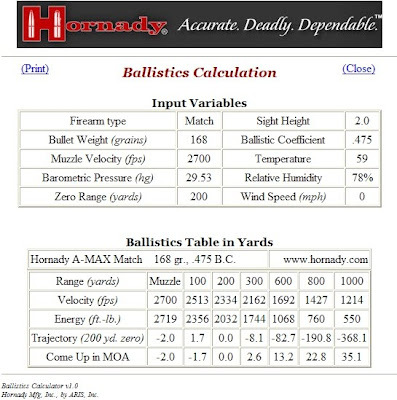 Ballistics Data for a Sight Height of 1.9"
Ballistics Data for a Sight Height of 2.0"
If you click here, you will see all the reviews related to this rifle. Believe me, there is much more. Also don't forget you can click on a photo and it will give you a high definition image so you can see more details.